Lydia Stam has an established practice in Family Law and Immigration Law. She was called to the Ontario Bar in 1996. She is a certified Mediator and a certified Collaborative Lawyer. Lydia was appointed a Legal Member for the Ontario Review Board in 2009. In 2010, she was elevated to the position of Alternate Chair and continues in this capacity on a part-time basis. She began her law practice in Windsor, Ontario, near her family home in Essex County. In 1999, an employment opportunity attracted her to Thunder Bay, Ontario. Having been raised in a small town, Lydia quickly fell in love with the people and opportunities that Northwestern Ontario had to offer. Lydia presents on topics such as the Rights and Responsibilities within a Marriage, Child Protection and Aboriginal Law, as well as on Immigration Law topics for various organizations. 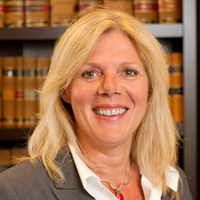 She also presents at the Mandatory Information Program for new Family Law litigants, has participated with the Law Society of Upper Canada on the Retention of Women In Private Practice and Contingency Planning. She is the past President of the Thunder Bay Law Association and sat on the Board of Directors for 8 years in various capacities. She was the Chair for the Family Law Continuing Education Program for 4 years. She has volunteered with Lakehead University's Law School as Moot Court Judge and as a panel presenter for Aboriginal Law education sessions. Lydia looks forward to continued participation with the Law School. Lydia's current community project is organizing volunteers for Lawyers Feed the Hungry at the Dew Drop Inn. One day each month, a group of lawyers, legal assistants, law students and family members prepare meals for and feed upwards of 200 people.